Wisconsin is joining the growing list of states that have decided to go smoke free. 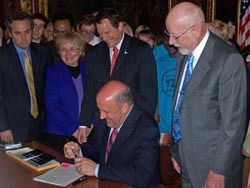 In an events at the Capitol on Monday, Governor Jim Doyle signed the bill that will ban smoking indoors at most Wisconsin workplaces. The governor says it&apos;s a day where "we can all take a deep breath and enjoy the accomplishment." The Legislature approved the bill last week, after a compromise was reached with the state Tavern League that delays the ban until July 5th of 2010 and still allows smoking in outdoor seating areas. Doyle says the phase-in period is regrettable, but admits it was necessary to move the bill forward. The battle to pass the statewide ban has seen several versions introduced at the Capitol, but those bills rarely moved beyond public hearings. The Governor thanked the Democratic leadership in the Senate and Assembly for allowing a vote to happen this time. Doyle says the ban will help protect the health of workers for years to come.